Hooray! Not only is it the last day of the 31 Day Nail Art Challenge, (for me, anyway... those who finished on time were done last Wednesday... O.o) it's also FRIDAY! Can I get an amen on that one? I don't know about you, but there were more than a few moments this week when I thought today would never get here! Prompt Numero 31 of #31DC2015 calls for us nailphiles to honor nails we love. It's been the year of the Seriotype here at Seize the Sparkle, so I chose to honor the lovely Nichole of Bedlam Beauty, formerly one half of Pretty Girl Science. This particular Seriotype is the one I tried my best to emulate. In case you haven't seen any of her other Seriotypes, you really need to check them out. Aaaand if you're scratching your head wondering what all this Seriotype business is about, her tutorial should help get you going in the right direction! The arrival of Friday also means another edition of Fishbowl Friday... the 49th edition! Yep. Fishbowl Friday is about to turn a whoooooole year old! This week, I drew the 3 COLORS prompt, and then proceeded to use 10 polishes. Because when is less ever really more? I started out with 2 coats of a Wet n Wild polish that came in both of the Holiday 2015 Mega Last Color Gift Sets. Check them out on Insta here and here! I lucked out and picked them up while Wet n Wild was BOGO at CVS, so I got both for the price of one. None of the shades have names on the bottles, and I think this is the first time that this particular shade has been reformulated for the Mega Last line. Previously, it was Gray's Anatomy in the Wet n Wild Fast Dry Line, and Paying with Platinum under Wet n Wild's Spoiled brand. Just in case you wondering why it totally looks familiar! Two very sheer coats later and I knew I needed something with a little more coverage. Since I don't really have a lot of holographic polishes, I figured I could put down holo and layer colors over it to mimic the look of using different colored holographic polish. After two layers of rainbow sparkly goodness, I knew I needed to add a darker color. So, I sponged on a layer of China Glaze Grape Juice. That gave everything a nice purple hue, and added more shimmer! From there, it was a little bit of a blur and a sponging jamboree! 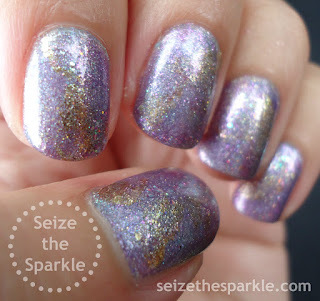 I added in random splashes of blue, pink, purple, gold, and all kinds of shimmer polishes. 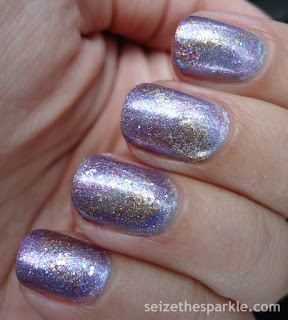 SinfulColors Starlet Fever supplied the larger opalescent hex glitter. When I was happy with the amount of color and sparkle, I painted on a coat of SinfulColors Clear Coat and a generous layer of Seche Vite. 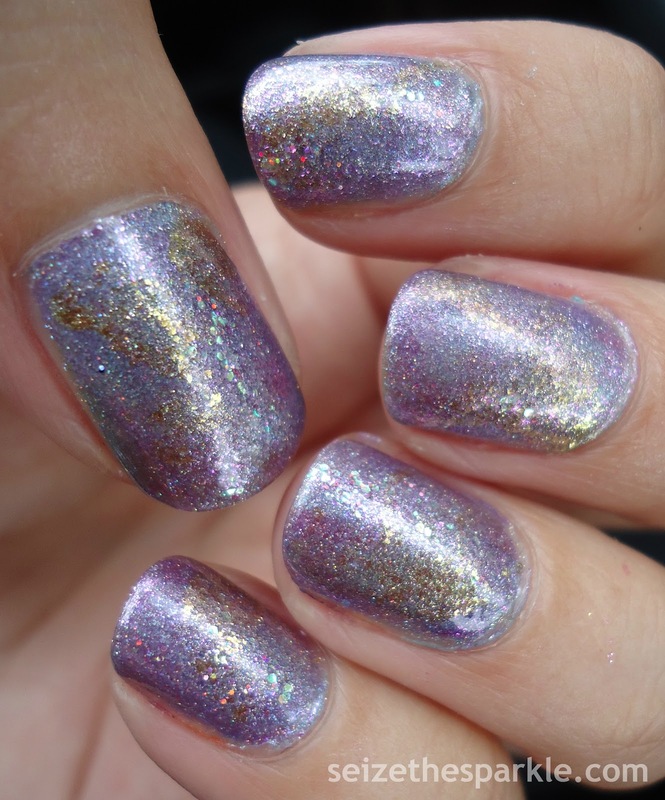 When I sat down to do this layering, I didn't really look at the exact polishes Nichole used. Mainly because I knew that I didn't have dupes for all of them. Instead, I went with the finished look and tried to recreate it based on what I knew I had in my stash. Admittedly, my version is a little bit lighter. It's more of a cousin manicure than a sister manicure. But that doesn't mean I love it any less! I'm definitely keeping this one on for another day!!! Yay! I'm finally finished with the chaaaaallenge! I'll be posting my #31DC2015 Recap post sometime next week. For now, I'm so stoked that it's Friday! (In case you couldn't tell!) And I can't forget to mention the fact that the plague looks like it's finally leaving Chez Sparkle. Yays all around! Not sure what we'll be getting up to this weekend... I'm thinking a little bit of shopping, a little bit of playing, and a whole lot of relaxing! What are your plans for the weekend? Whatever you get up to, I hope you have a great one, too!!! your seriotypes are better than mine. Stop that.